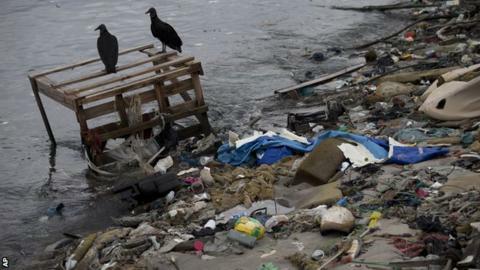 Cleaning up the polluted bay where sailing and windsurfing competitions will be held at Rio 2016 remains a serious challenge, the International Olympic Committee president has said. Sailors in Guanabara Bay have reported seeing pollution including furniture and floating animal carcasses. Nearly 70% of sewage in the Brazilian city is spilled raw into its waters. Thomas Bach said Games preparations were on track but challenges remained, "first of all the cleaning of the bay". The Rio state government has already said it will miss its target of reducing pollution in the Guanabara bay by 80% ahead of the Olympics, which begin on 5 August 2016. Bach said some measures to clean the waters had already started, while others "will be applied to the bay just before the Olympics to make sure there is the safety and the health of the athletes". The German also said demands on completing the international broadcast centre in Rio were "really pressing" but added there had been "great progress" in the Olympic village and other sports facilities. "We are very confident we will have a great Games in one year. Acknowledging challenges is the first and most important step to overcoming them."